Hoodia parviflora [on the pic above] is a cactus from Southern Africa, just like Hoodia gordonii. The local population uses dried parts of these plants to suppress hunger, and in the sixties South African scientists started looking for ways to make slimming products from these plants. In the first decade of 21ste century, Pfizer and later Unilever, thought that the steroid-like Hoodia gordonii component p57 could be an interesting ingredient for weight-loss drugs or slimming functional foods, but halted their research when it turned out that p57 made users nauseous. Israeli Desert Labs [eating-less.com] has been researching Hoodia parviflora for several years, and has started producing extracts of this plant. They are meant for supplements, chewing gum, tea and bars. According to human research conducted by Desert Labs itself, people who ingest an equivalent of 142.5 milligrams of dried Hoodia parviflora powder for 40 consecutive days lose just over half a kilogram of body weight. [J Med Food. 2015 Feb;18(2):250-8.] Without change of lifestyle. And without side effects. In 2017, the European Food Safety Agency EFSA decided that novel foods with a maximum of 9.4 milligrams of Hoodia parviflora per daily dose should be allowed on the European market. [EFSA Journal 2017;15(10):5002.] That is less than the 142.5 milligram with which DesertLabs achieved such nice results. Perhaps smart and unscrupulous chemists still find a way to circumvent EU regulations. 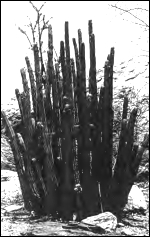 The active substances in Hoodia parviflora, the hoodigosides, are effective in very small quantities. In 142.5 milligrams there are at most 1.43 milligrams of hoodigosides. With a good purification process, it may still be possible to make surprisingly effective weight loss supplements with Hoodia parviflora. Completely compliant with European regulations. J Med Food. 2015 Feb;18(2):250-8. Carnosic acid is used in toothpaste, processed meat, pizzas and sauces. It occurs naturally in ordinary herbs, and functions well as a biological conserving agent. And as a slimming aid. A hefty dose of Hibiscus sabdariffa extract in a supplement causes modest weight loss. Athletes who want to stock up on carbohydrates before or after a workout, but are worried about increasing their fat reserves, may want to try eating mango.